A lot of people read Jalopnik. More than 8 million globally this month alone, in fact. They range from everyday car enthusiasts to people who clicked an errant Facebook link about sloths to auto industry professionals. Honda’s lawyers are demanding that we take down a set of comments from an apparent reader in the third group. We’re not gonna do that. In December, a commenter calling him or herself HondAnonymous, posted a string of comments on these posts claiming to be a technician at Honda’s research and development facility. Interesting, if not earth-shattering. A lot of it sounds like normal car development. The first one is a complaint we’ve seen in various early NSX tests, and the last is probably a recall waiting to happen. Not exactly on the level of “Here’s the new Corvette,” if you catch my drift. In fact, this happens quite a bit around here. Whether they come out and admit it or not, many of our readers happen to work in the auto industry in some capacity. Some post about their knowledge and experiences, some do not. Jalopnik, of course, neither sought nor published any stories (until now) about Honda’s alleged production problems. They just ended up on our site. Citing a lack of immediate information on the situation, a Honda spokesman declined to comment Tuesday evening. It’s pretty egregious for a corporation to try to bully a news organization into deep-sixing comments from its own readers. It’s far more egregious to threaten to subpoena us if we don’t dox one of those readers. What’s worse, Honda’s specious demand is based on absolutely no evidence. 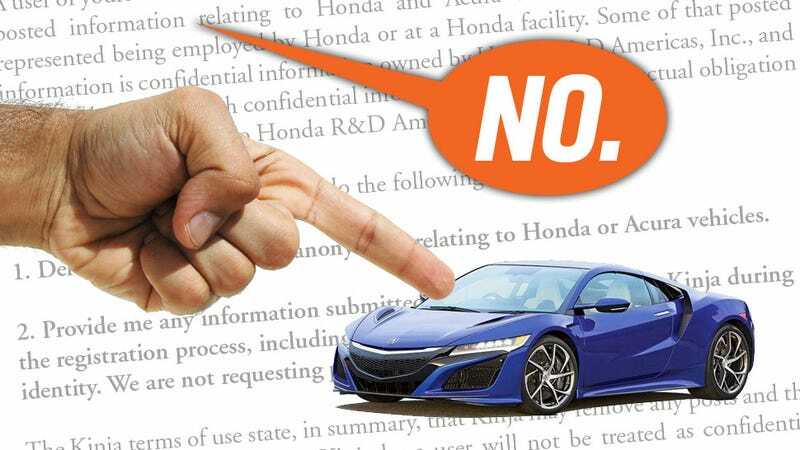 The attorneys claim that HondAnonymous violated a non-disclosure agreement by posting here, but they have absolutely no idea who HondAnonymous is, whether he or she really works at the company, or whether he or she signed any sort of agreement at all—which is why they are asking us for his or her user account information. The good news is we couldn’t dox HondAnonymous even if we somehow wanted to. He or she used an anonymous burner account, and we don’t track passwords, logins, or IP addresses for any of our users. HondAnonymous’ posts will stay up. To Honda, or any other automaker: If you would like us to delete the comments of our readers or expose their identities (which, again, we can’t do anyway) again, please let me know! I am more than happy to drag your intimidation tactics into the public eye for all your customers and prospective buyers to see. Govern yourselves accordingly. And see you at the NSX launch!